With the growing trend towards reusing materials and with increasingly stringent environmental, it has become essential that their behaviour should remain predictable throughout their life cycle. In this perspective, evaluation tests for prediction purposes are under development on a European level. However, a pertinent interpretation of data can only be accomplished through the use of purpose-built tools. Therefore, this preoccupation is currently being addressed by compiling a thermodynamic database specifically designed for waste. This can only be developed successfully provided contributions to it are obtained from a wide variety of sources and its use is coordinated amongst different laboratories, both in France and the rest of Europe. Its future objective could be to act as the cornerstone of a European expert system that allows the reactivity of materials to be modelled and their impact on the environment to be assessed in line with how they are used. In order to comply with European recommendations on the reduced use of mineral raw materials, it will be necessary, in addition to redesigning industrial processes, to recycle industrial by-products more efficiently. This reuse, however, will need to be ever more respectful of the environment, and the rules of usage will be increasingly restrictive. This is why, over the past several years, waste management policies have come under pressure to assess and forecast the physicochemical future of these substances. In concrete terms and at a European level, this has resulted in i) the establishment of standardisation approaches (acid-base neutralisation capacity measures, pH-controlled leaching, batch leaching, leaching by upward percolation, monolith leach tests) that are likely to provide the data needed to build models, and ii) a more generalised use of geochemical and hydrochemical numerical modelling. However, the conclusions that can be drawn from these measures are quite mixed, due to the difficulty of achieving a coherent framework at a European level that makes possible the coordinated use of the different data derived from the proposed approaches: only the approaches necessary for data acquisition are standardised. These conclusions show that much more effort needs to be devoted in Europe to this issue in order to i) develop shared expertise on leaching and related modelling on environmental impact, and ii) increase the level of knowledge so as to enhance the weight of French expertise within the different European think tanks. On the basis of experimental analysis (in batch or even in columns), the empirical approach consists in establishing empirical relationships that are able, in particular, to describe delaying factors. In this case, the evaluation of the potential pollutant is only valid for the conditions of the experiment. This type of approach poses a problem when it comes to extrapolating the experimental results to other scales, different scenarios, and longer timeframes. Its only advantage is its ease of implementation. Mineral waste consists of artificial products. Although the classic thermodynamic databases of geochemical models are well suited to natural minerals, they are less so when it comes to certain mineral phases contained in the waste. Amongst these, some are crystallographically close to the mineral phases in natural minerals, but differ from them in the elements they contain; others are very rare or even unknown in natural environments. The mineral phases in the different types of waste are commonly represented by solid solutions, something that implies a relative variability in their chemical composition within a given waste material. The same phase can be present in the same sample with various degrees of crystallinity, ranging from a crystalline form to a vitreous, or even a hydrated amorphous form. To these crystallographic complexities is added the kinetic aspect. While it may be possible to disregard this in the scale of geological time, i.e. when dealing with hundreds of thousands of years, kinetics can become a key parameter in the short term that must be taken into account. Currently, no database includes the specificity of mineral waste. This gap poses the major obstacle to developing the mechanistic approach, which provides information that is easier to extrapolate and more predictable than with the empirical approach and can provide, should that be necessary to the decision-making process, much higher-quality information. To compile a chemical-mineralogical database on mineral waste resulting from chemical and/or thermal processes and draw up a typology for this waste. On the basis of the typology and, through analysis of data from the literature, to determine the main possible reaction paths. To compile from chemical and mineralogical literature all the solid-solution models available and applicable to the minerals present in waste. To extract essential facts from all existing models used to assess the thermodynamic data on mineral phases. 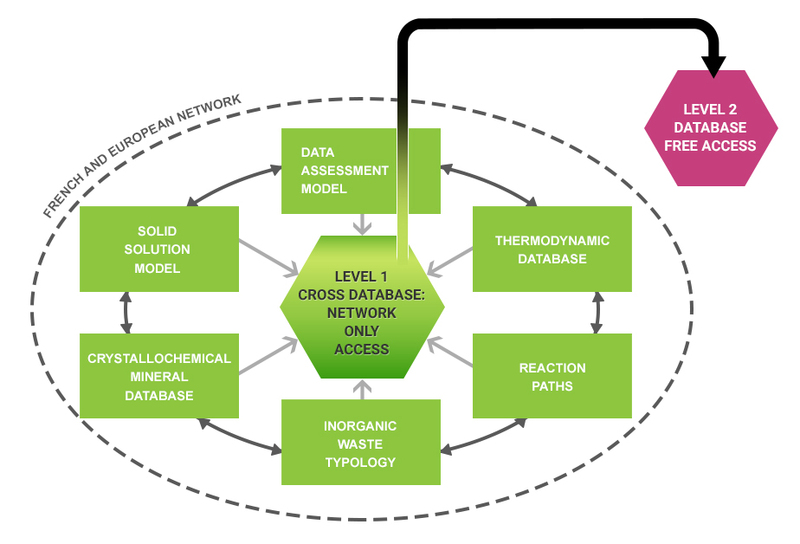 Once the prerequisites have been established, constituting the know-how capitalisation phase, it is then possible to populate the thermodynamic database applied to waste material, starting from the compilation of literature data and/or assessments either by calculation or on the basis of experimental measurements. Figure 1 – Details of the content of the THERMODDEM database and its levels of operation. Consistency and validation of the data is ensured by critical analysis of the values introduced into the database and by their use in modelling applied to the waste material. Subsequently the kinetic aspect of the reactions should be taken into account by selecting the kinetic laws applicable to the different phases in waste or even by selecting the empirical laws appropriate to the context. Moreover, an assessment must be carried out to take into account the amorphous environment. In its initial stage, the construction of the database proper is limited to inorganic compounds. Subsequently, it will be expanded, thanks to the potential of the European network organised around the project, to include the main parameters useful for organic compound speciation. Concerning mineral phases, three types of data will be provided in this base, to be made accessible on the web. The first category consists of mineralogical information and has two objectives, namely to inform or guide the user (in the choice of mineral phases and the interpretation of the behaviour of the system) and to aid in a critical review of the thermodynamic data; the chemical formula; the mineralogical family, the members of the family and the possible the poles for solid solutions; the polymorphs; the crystalline structure; and a mineralogical classification system (Dana’s system was chosen). The second includes information on the thermodynamic properties of the mineral phases, with the objective of: providing data to generate specific databases (for computer codes); supplying information to generate data (ideal solid solutions); and identifying sources. Lastly, are also provided, data on the occurrence of the mineral in natural or artificial environments, providing the base’s user with references on the phase’s actual range of stability (Figure 1). In addition to the base devoted to mineral phases, THERMODDEM also manages a base on aqueous species. This is crucial, not only to supply the data necessary for calculating reaction properties, but also to generate code-specific databases. It includes standard individual properties at 25°C and 1 bar, the HKF Helgeson-Kirkham-Flowers, a formalism for the equation of state that describes the Gibbs free energy of the electrolyte as a function of increasing temperature and pressure.]] parameters (or other formalism), complexation equations in the aqueous phase, standard reaction properties, a polynomial allowing the calculation of the evolution of an equilibrium constant versus temperature (log K (T) = A + BT + C/T + D lnT + E/T2) and a grid of log K (0, 25, 60, 100, 150, 200, 250, 300°C) so as to generate and export files in formats compatible with the geochemical computer codes most currently used (PHREEQC, MINTEQ, EQ3/6,…). This database, prepared under Excel®, is then exported under Access®. Next, it is transformed under Oracle®, which handles data management for consultation on the website. Figure 2 – Main window of THERMODDEM database. The automatic expression of the reaction in terms of the chemical formula of the complex or the mineral and of the basic species. The transposition of formation data to reaction data. The computation of reaction data according to the chosen primary species (with a possibility of creating a base of the desired aqueous species). The calculation of the phase transition properties for the minerals in question. The calculation of the properties of the aqueous complexes according to HKF formalism, which allows the thermodynamic properties to be calculated, and hence the stability of the aqueous complexes at high temperature (up to 300°C in the THERMODDEM framework). The calculation of coefficients A, B, C, D and E of the polynomial relationship that allows the equilibrium constant versus temperature to be obtained. The constitution of a text file usable as a database by the PHREEQC code or others. Tests of the various options. In short, the tool makes it possible to so from the fundamental thermodynamic properties to the reaction constants in the aqueous phase, which to the best of our knowledge makes it a unique tool. It has also been designed to automatically update all the constants used by THERMODDEM, in case a correction is made in the fundamental properties of a basic species [i.e., Al3+, Si4+]. - Pb, Cd, Co, Sr and Cr for the trace elements. Future developments could involve the major elements Fe, P, N and F and a review of Ni, Cu, Cs, Zn, Hg, Ag. A special effort is made, for each phase that is introduced, to supply information on the properties that allow the influence of temperature to be taken into account. Certain waste materials contain highly soluble phases. When these materials enter into contact with water, the salts are dissolved, which may generate strong ionic forces. In these cases, such classic activity models as Davies and Debye-Hückel are no longer valid, and more suitable approaches must be sought. Best known of these is the Pitzer approach (1973) that relies on the semi-empirical representation of the specific interactions amongst the dissolved species. This approach, which differs from those followed for dilute solutions, requires its own database, at least to calculate the activity coefficients for the aqueous species. The equilibrium constants for both homogenous and heterogeneous reactions must remain coherent between the two approaches. The maintenance of a database adapted to saline systems is one of the tasks currently being carried out so as to ensure a wider scope of applications for the THERMODDEM tool. 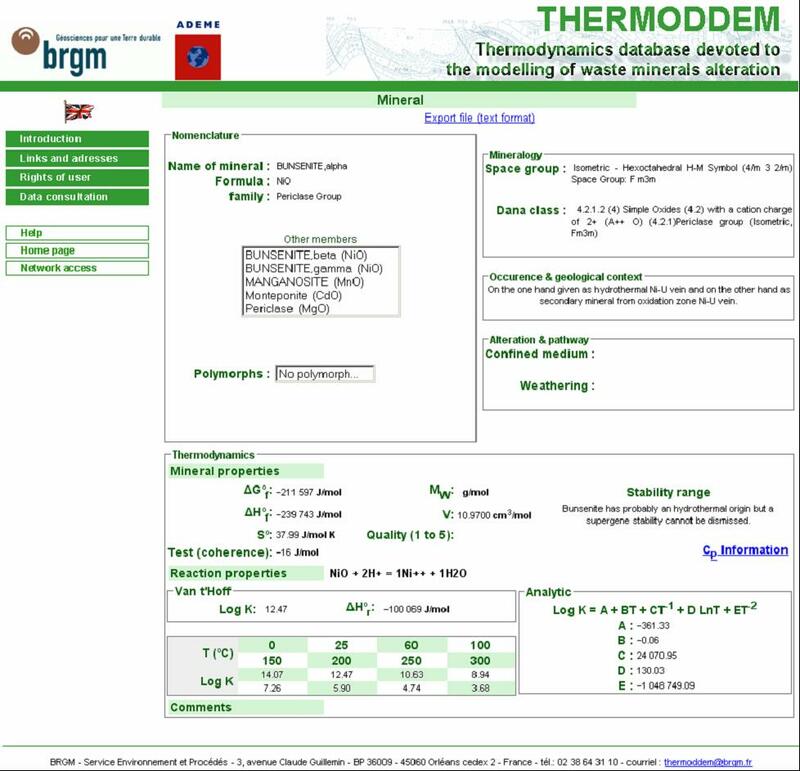 The objective of a thermodynamic base devoted to waste, addressed in line with a deontology developed for THERMODDEM (data harmonisation, the identification of mineralogical families and groups, the description of known zones of stability, capitalising on the data for different activity models, etc.) is an essential process to improve the reliability of modelling and prediction. Because it compiles simultaneously thermodynamic data and knowledge that has been gained (natural and artificial systems), it brings a new dimension to the apprehension of the values used and of the mineral combinations taken into account in numerical models. This base, initially comprising inorganic species, will subsequently be expanded to take into account organic ones. But its successful development is contingent upon contributions obtained from a wide variety of sources and its coordination amongst different laboratories at a national and European level. Its future objective could be to serve as the cornerstone of a European expert system to allow the reactivity of materials to be modelled and their impact on the environment to be assessed according to how they are used. Alexander G.B., Heston W.M. and Iler R.K., 1954. The Solubility of Amorphous Silica in Water. J. Phys. Chem., 58, p. 453. Correns C.W., 1941. Beitrage zur Petrographie und Genesis der Lydite (Kieselschiefer): Preuss. Geol. Ladesanstalt, Mitt. d. Abt. f. Gesteins-, Erz-, Kohle-und Salz-Untersuchungen, 1, p. 18-38. Helgeson, H.C., Delany, J.M, Nesbitt, H.W., and Bird, D.K., 1978. Summary and Critique of the Thermodynamic Properties of Rock-Forming Minerals: Amer. J. Sci., 278A, 229 pp. Iler R.K., 1979. The Chemistry of Silica: Solubility, Polymerization, Colloid and Surface Properties, and Biochemistry. Wiley, New York. Okamoto G., Okura T., and Goto K., 1957. Properties of silica in water. Geochimica et Cosmochimica Acta, 12, p. 123-132. Pitzer K. S. (1973) Thermodynamics of electrolytes - I. Theoretical basis and general equations. Journal of Physical Chemistry, 77, 268-272. Sverjensky D.A., Shock E.L., and Helgeson H.C., 1997. Prediction of the thermodynamic properties of aqueous metal complexes to 1000°C and 5 kb. Geochim. Cosmo. Acta, 61, p. 1359-1412. Weber C.F., and Hunt R.D., 2003. Modeling Alkaline Silicate Solutions at 25 °C. Ind. Eng. Chem. Res., 42, p. 6970-6976.